Seattle Reign FC beat the Washington Spirit 2-0 at home on Sunday night. The win — combined with the rest of the Week 19 results — gives the Reign a bit of breathing room in second place. They are now 9-4-6 with 33 points, three points ahead of the third-place Orlando Pride. For the Spirit, it’s their tenth straight game without a win, and sixth straight loss. The result drops them to 2-13-4 with 10 points on the season. Reign forward Jasmyne Spencer scored the game’s first goal in the 44th minute, a chip in the box on an assist from Allie Long for her first goal in a Seattle uniform. Spencer started in place of Beverly Yanez, who missed the match due to a foot fracture. The Reign doubled their lead in the 71st minute on a quick throw-in from Megan Rapinoe to Jodie Taylor, who scored to make it 2-0. It’s Rapinoe’s second assist on a throw-in this season, both of which were on Taylor goals. The Spirit did see the return of Mallory Pugh in the match — her first game since May 27th, after missing time due to a right PCL sprain. Washington was finally able to get Pugh on the field with Andi Sullivan and Rose Lavelle this season, as the trio all subbed on in the second half and played the final 21 minutes of the game together. Reign goalkeeper Lydia Williams made two saves and earned her seventh shutout of the season. Her best effort came in the 80th minute, a stop in the box on a shot from Caprice Dydasco. DiDi Haracic started in goal for the Spirit, the third different goalkeeper to start a game for Washington this season. She made four saves in the game. The Spirit will next be in action on Wednesday night on the road vs. Utah Royals FC. The Reign will also play Utah in their next game, on Saturday at Rio Tinto Stadium. Match ends, Seattle Reign 2, Washington Spirit 0. Second Half ends, Seattle Reign 2, Washington Spirit 0. Substitution, Seattle Reign. Jaycie Johnson replaces Megan Rapinoe. Jodie Taylor (Seattle Reign) wins a free kick in the defensive half. Substitution, Seattle Reign. Christen Westphal replaces Jasmyne Spencer. Attempt blocked. Andi Sullivan (Washington Spirit) right footed shot from the right side of the box is blocked. Assisted by Mallory Pugh. Corner, Washington Spirit. Conceded by Alyssa Kleiner. Foul by Megan Oyster (Seattle Reign). Rose Lavelle (Washington Spirit) wins a free kick in the defensive half. Megan Oyster (Seattle Reign) is shown the yellow card for a bad foul. Offside, Washington Spirit. Estelle Johnson tries a through ball, but Mallory Pugh is caught offside. Attempt saved. Caprice Dydasco (Washington Spirit) right footed shot from the centre of the box is saved in the bottom left corner. Assisted by Taylor Smith with a cross. Attempt missed. Jessica Fishlock (Seattle Reign) right footed shot from outside the box is close, but misses to the left. Assisted by Jodie Taylor. Foul by Morgan Andrews (Seattle Reign). Morgan Andrews (Seattle Reign) wins a free kick on the right wing. Hand ball by Jessica Fishlock (Seattle Reign). Offside, Seattle Reign. Jessica Fishlock tries a through ball, but Jodie Taylor is caught offside. Attempt blocked. Allie Long (Seattle Reign) left footed shot from outside the box is blocked. Assisted by Megan Rapinoe. Attempt missed. Megan Rapinoe (Seattle Reign) right footed shot from outside the box is just a bit too high. Assisted by Morgan Andrews. Attempt missed. Caprice Dydasco (Washington Spirit) left footed shot from the centre of the box is just a bit too high. Assisted by Taylor Smith. Goal! Seattle Reign 2, Washington Spirit 0. Jodie Taylor (Seattle Reign) right footed shot from the left side of the six yard box to the high centre of the goal. Assisted by Megan Rapinoe. Corner, Seattle Reign. Conceded by Rebecca Quinn. Substitution, Washington Spirit. Mallory Pugh replaces Ashley Hatch. Substitution, Seattle Reign. Morgan Andrews replaces Kristen McNabb. Attempt saved. Allie Long (Seattle Reign) left footed shot from the right side of the box is saved in the bottom right corner. Assisted by Jasmyne Spencer. Attempt missed. Jasmyne Spencer (Seattle Reign) header from very close range is just a bit too high. Assisted by Kristen McNabb with a headed pass following a corner. Attempt missed. Jodie Taylor (Seattle Reign) right footed shot from the centre of the box is just a bit too high. Assisted by Megan Rapinoe. Attempt blocked. Whitney Church (Washington Spirit) right footed shot from outside the box is blocked. Assisted by Meggie Dougherty Howard. Substitution, Washington Spirit. Rose Lavelle replaces Francisca Ordega. Substitution, Washington Spirit. Andi Sullivan replaces Havana Solaun. Attempt missed. Megan Rapinoe (Seattle Reign) right footed shot from outside the box is high and wide to the right. Assisted by Alyssa Kleiner. Megan Oyster (Seattle Reign) wins a free kick in the defensive half. Theresa Nielsen (Seattle Reign) wins a free kick in the defensive half. Attempt missed. Ashley Hatch (Washington Spirit) right footed shot from outside the box is high and wide to the right. Attempt missed. Havana Solaun (Washington Spirit) right footed shot from outside the box is close, but misses to the right. Assisted by Meggie Dougherty Howard following a set piece situation. Foul by Kristen McNabb (Seattle Reign). Alyssa Kleiner (Seattle Reign) wins a free kick in the defensive half. Attempt missed. Meggie Dougherty Howard (Washington Spirit) left footed shot from the centre of the box misses to the right. Assisted by Ashley Hatch with a headed pass following a corner. Corner, Washington Spirit. Conceded by Lydia Williams. Attempt saved. Ashley Hatch (Washington Spirit) left footed shot from outside the box is saved in the top centre of the goal. Assisted by Havana Solaun. Attempt saved. Alyssa Kleiner (Seattle Reign) right footed shot from the left side of the box is saved in the top left corner. Assisted by Jessica Fishlock. Second Half begins Seattle Reign 1, Washington Spirit 0. First Half ends, Seattle Reign 1, Washington Spirit 0. Goal! Seattle Reign 1, Washington Spirit 0. Jasmyne Spencer (Seattle Reign) right footed shot from the centre of the box to the high centre of the goal. Assisted by Allie Long. Allie Long (Seattle Reign) wins a free kick in the defensive half. Corner, Washington Spirit. Conceded by Theresa Nielsen. Attempt blocked. Jasmyne Spencer (Seattle Reign) left footed shot from outside the box is blocked. Assisted by Theresa Nielsen. Attempt blocked. Jodie Taylor (Seattle Reign) right footed shot from the right side of the six yard box is blocked. Assisted by Jessica Fishlock. Attempt missed. Taylor Smith (Washington Spirit) right footed shot from the right side of the box misses to the right. Assisted by Francisca Ordega. Havana Solaun (Washington Spirit) wins a free kick in the defensive half. Attempt missed. Megan Rapinoe (Seattle Reign) left footed shot from the left side of the box is close, but misses the top right corner. Assisted by Theresa Nielsen. Attempt missed. Allie Long (Seattle Reign) right footed shot from the centre of the box is too high. Offside, Washington Spirit. Tori Huster tries a through ball, but Ashley Hatch is caught offside. Foul by Alyssa Kleiner (Seattle Reign). Francisca Ordega (Washington Spirit) wins a free kick in the defensive half. Hand ball by Alyssa Kleiner (Seattle Reign). Attempt blocked. Allie Long (Seattle Reign) header from the centre of the box is blocked. Assisted by Theresa Nielsen with a cross. Attempt blocked. Jessica Fishlock (Seattle Reign) right footed shot from outside the box is blocked. Assisted by Theresa Nielsen. Attempt saved. Jessica Fishlock (Seattle Reign) right footed shot from the centre of the box is saved in the bottom left corner. Corner, Seattle Reign. Conceded by Tori Huster. Corner, Seattle Reign. Conceded by DiDi Haracic. Attempt saved. Jessica Fishlock (Seattle Reign) right footed shot from the left side of the six yard box is saved in the bottom left corner. Assisted by Megan Rapinoe. Attempt missed. Ashley Hatch (Washington Spirit) header from the centre of the box misses to the left. Assisted by Meggie Dougherty Howard with a cross. Attempt missed. 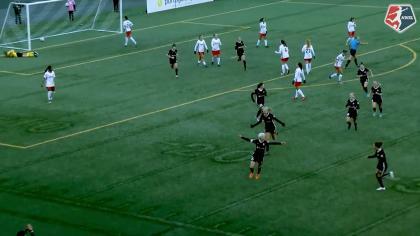 Jessica Fishlock (Seattle Reign) right footed shot from outside the box is too high. Assisted by Megan Rapinoe. Attempt missed. Jodie Taylor (Seattle Reign) right footed shot from the right side of the box misses to the left. Assisted by Jasmyne Spencer. Attempt blocked. Megan Rapinoe (Seattle Reign) left footed shot from a difficult angle on the left is blocked. Assisted by Jessica Fishlock. Attempt missed. Ashley Hatch (Washington Spirit) right footed shot from outside the box is too high. Assisted by Taylor Smith. Jasmyne Spencer (Seattle Reign) wins a free kick in the attacking half. Corner, Seattle Reign. Conceded by Francisca Ordega. 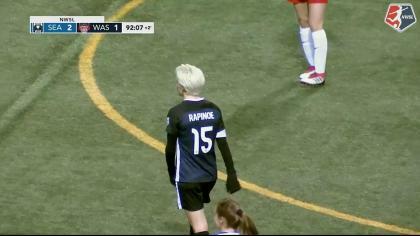 Megan Rapinoe (Seattle Reign) wins a free kick in the defensive half. Attempt missed. Tori Huster (Washington Spirit) right footed shot from outside the box is high and wide to the left from a direct free kick. Taylor Smith (Washington Spirit) wins a free kick in the attacking half. Attempt missed. Jasmyne Spencer (Seattle Reign) right footed shot from the right side of the box is too high. Assisted by Jessica Fishlock.